Crazy delicious and easy Instant Pot recipe with chicken in a sticky sweet and savory honey sesame sauce! This juicy, tender, moist chicken will be an instant hit with your family! Instant Pot is best for making chicken. The pressure cook time is usually very short, depending on the type of chicken used. If you have a killer sauce recipe, dinner is guaranteed to be a success. 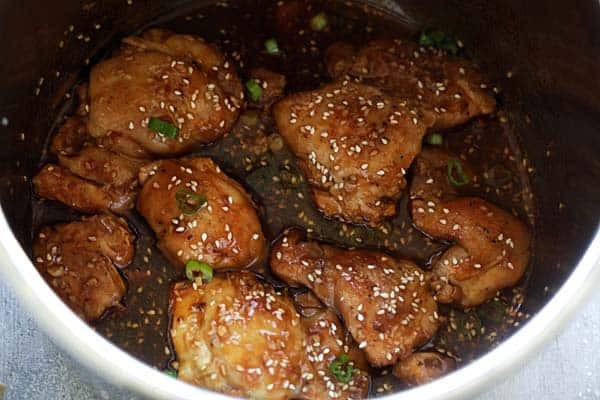 Just like these tender, juicy, moist and soft chicken thighs swimming in the mouthwatering honey sesame sauce. Much like my popular Instant Pot Honey Garlic Chicken, the sauce calls for simple ingredients: honey, sesame oil, soy sauce, Apple cider vinegar, chili garlic sauce and chicken broth. The flavor is savory, sweet, with a tint of tartness and heat. This Instant Pot chicken is now my #1 favorite dinner recipe. For the chicken, I used skinless and boneless chicken thighs and they are perfectly cooked in 8 minutes. Active time is a sweet 5 minutes, so dinner is ready for the entire family in practically 15 minutes! No wonder Instant Pot is now my favorite kitchen appliance. Serve the chicken over steamed rice, just like the picture above and you have the most amazing Asian chicken dinner ever. Enjoy! Instant Pot Honey Garlic Chicken – Everyone’s Favorite! Instant Pot Creamy Garlic Mushroom Chicken – Amazing with pasta. Instant Pot Honey Mustard Chicken – Juicy and Tender Chicken Dinner. Instant Pot Butter Chicken – Just Like Indian Buffets. Instant Pot Honey Sesame Chicken - crazy delicious and easy Instant Pot recipe with chicken, sticky sweet and savory honey sauce with sesame! This juicy, tender, moist chicken will be an instant hit. Wash and rinse the chicken thighs with cold water. Pat dry with paper towels. Season the chicken thighs with salt and pepper. Set aside. Mix all the ingredients in the Sauce together, stir to mix well. Make sure the honey and corn starch are completely dissolved. Set aside. Turn on the Saute mode on your Instant Pot. As soon as the pot is fully heated (to make sure the chicken doesn’t stick to the pot), add the cooking oil. Pan sear the chicken thighs until they turn slightly brown (if they stick to the pot too much, you may use a non-stick skillet for pan-searing or skip this step.) Add the the garlic and saute a little bit. Pour in the sauce and top with the white sesame. Cover the pot and select Manual and set to High pressure for 8 minutes. When it beeps, turn to Quick Release. 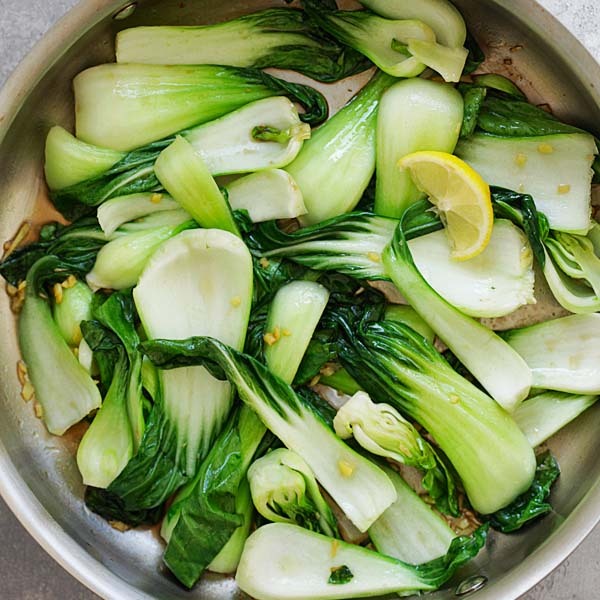 When the valve drops, remove the cover carefully, add the chopped scallion and serve immediately. If the sauce is too watery, make sure you set the Instant Pot to Saute mode to reduce the sauce, for about 2 minutes or so. If the sauce is lighter in color compared to the pictures, you might add some dark soy sauce to make the sauce darker in color. Different soy sauce has different color, some lighter and some darker. If you use a lighter color soy sauce, the sauce will look lighter but the taste should be about the same. If your sauce turns out light brown in color, that's because I used dark soy sauce, to add color to the sauce. The taste will be the same nonetheless. If you don’t have an Instant Pot, you can make this honey sesame chicken in a slow cooker, or on your stove top. If you use a slow cooker, use high heat and cook for 3 hours. For stove top, just pan-fry the chicken and then add in the Sauce. Simmer on low heat and cook until the chicken meat is tender. You can pan-fry the chicken on a non-stick skillet instead of using the Saute Mode. You can also skip the step. All photos and recipes on Rasa Malaysia are copyright protected. Please do not use the photos and recipes without prior written permission. 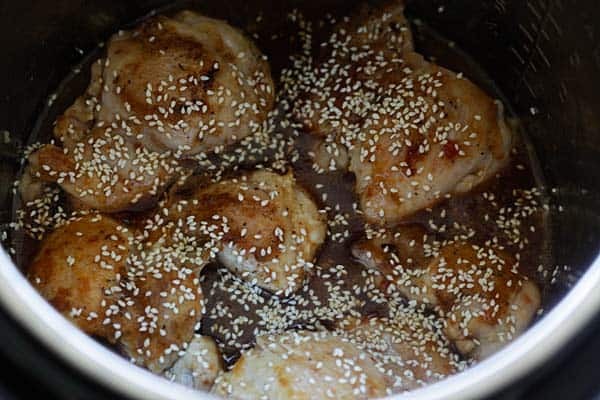 If you wish to republish this recipe, please rewrite the recipe in your own words instead of copy and paste and link back to //rasamalaysia.com/instant-pot-honey-sesame-chicken/. Thank you very much! Looks delish! Your instructions mention to dissolve honey and sugar thoroughly, but sugar is not listed in ingredients…. The recipe mentions to mix the honey and sugar well but I don’t see sugar in the list of ingredients. How much and what kind of sugar? Thanks! Hi Paula, sorry, it was a typo, there is no sugar. Thank you! Picking up ingredients to put this on next week’s meal plan. Looks & sounds delicious! Love your IP recipes especially the Honey Garlic Chicken! I am on the Keto diet and want to stay in ketosis. I want to make your Honey Sesame Chicken , do you know if all the ingredients are keto approved? If not, do you have any recipes similar recipes that are? Thanks! Hi Karen, thanks for your comment, I am not familiar with Keto diet so I can’t say much about it. If you love my honey garlic chicken, this should be fine as it’s quite similar. OK, just finished making this and it looks nothing like the picture, the sauce is thin and the chicken (I used breasts) is very pale. I’m attempting to improve it by reducing the sauce to thicken it and then put the chicken back in to coat, but am wondering how you got the color on it. I did indeed brown the chicken on both sides before cooking, got a nice enough tint to it. Hoping this turns out better when I thicken the sauce some. Hi JS, my soy sauce is pretty dark in color. Some soy sauce is lighter and some are darker in color. If you want the coloring, you can add 1/2 teaspoon dark soy sauce but the taste would be the same! Thanks, I have dark soy so will try that. I pulled the chicken, reduced the sauce in the pot on sauté, then sliced the chicken and returned it to the pot and stirred to coat. 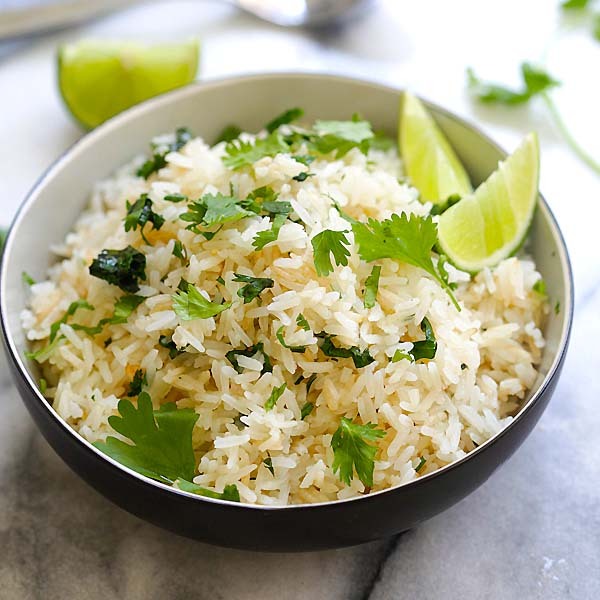 Absolutely delicious, served it over rice with a little Thai sweet hot sauce. I find that your site has a very high proportion of recipes that are keepers, so thanks! Just made this and the proportions of the sauce must be off. Mine came out in a huge pool of watery brown liquid. I added more cornstarch and put it on saute mode to reduce sauce like a previous reviewer. Taste is great, i’d add something spicy to give it a kick next time. 5seemed as if a lot of people on your reviews might be sing an 8at cooker ! That will cause these results and is a topic/issue that keeps getting over looked in your responses. I just got n 8 at Crock pot brand multi cooker and look forward to making this recipe and many more from your site ! The advertising is really slowing down your nice site and making it kinda un-usable ? Hi Robin, I am sorry to hear that. Where are you viewing it from? Everything is loading fast for me. I had a similar experience as others above – my chicken was not brown (even though I sautéed it on high in my instant pot) and the sauce was very thin. I added extra corn starch after it was done, and sautéed it a little longer to thicken. But mine did not look anything like the picture either. I thought the flavor was good. I may try browning the chicken in a frying pan next time – maybe coat it with a little flour. I just made this and followed your instructions exactly. Mine looks nothing like the picture either. Sauce is runny and not dark at all. Are u sure the cornstarch amout is enough? Also in the first paragraph you mention a chili garlic sauce but it is not listed inthe ingredients. Hi Susan, did you saute the chicken after pressure cooking to reduce the sauce. As the sauce is reduced, it might turn darker. Another factor might be the soy sauce you used. Some soy sauce is darker and some soy sauce is lighter and more liquidy. My soy sauce is the darker version. I use Kikkoman naturally brewed soy sauce. I came across your site from an IP facebook group. I am liking your recipes and that you answer people’s questions without getting upset that same questions have been asked by most. Mine is a tecnical question. What do I do when I like your recipe and want to save it so I can find it easily later. I have just bought an instant pot and want to collect IP recipes. yum, just made this tonight! I used hot sesame oil in addition to the chili garlic sauce, so it really had some heat, but not too much! I too noticed that the sauce hadn’t thickened. I think that from sauteing the chicken in the instant pot, the juices of the chicken added to the liquid. But that sauteing at the end worked great. I used chicken breasts instead of thighs, cut them horizontally so they wouldn’t be too thick, and then also cut them vertically in half or thirds to make the pieces more manageable, so maybe that contributed to the additional juice..
My sesame seeds didn’t stay on top of the chicken though. Maybe next time I’ll put more on before serving. now … to go find Jyoti’s facebook IP group! 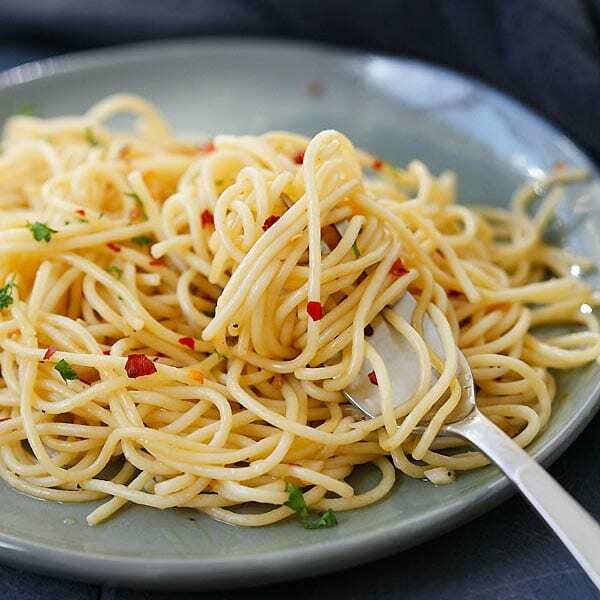 Thank you for this recipe—it’s just as easy as you say, and it turned out great! Only thing I did a little different was the sauce seemed a little thin at the end of cooking so I turned the IP to “saute” for a couple of minutes while I was scooping rice into bowls. Was perfect after that. I made this tonight and had the same issue with the sauce, however I cooked it on saute for a few minutes after and it did not thicken. Love the flavor though. My sesame seeds dissolved while it cooked though. Will definitely make this again. Yes, in the recipe I already stated clearly to turn on Saute mode to reduce the sauce, it will definitely reduce the sauce if you saute for 2 mins or longer. There is no way it wouldn’t thicken. Anyway, try it next time. Will this recipe work well with skinless bone in chicken thighs? That’s what I have in freezer, and I’d love to try this recipe. Hi Rasa, I was wondering with this recipe, can I use the small chicken drumsticks and would they cook with the same recipe as above. Hello, I’d love to try and make this but I’m not fining the recipe anywhere.. can you please help? The recipe is at the bottom of the screen, please scroll down. I made this once, and the family LOVED it. Mine also did not look like the pictures, but who cares? The taste was great! I think I will need to double the recipe to keep everyone happy next time. If I want to double this, will the cooking times need to change? If so, what times do you recommend? I think you will double everything with double the liquid cook time should be the same! Hi Lauren, sorry I am not sure. So I made this tonight and though I used the same soy sauce, mine didn’t look like the pic at all. And I had to top up the liquid because my IP needs 1C of liquid and those ingredients didn’t even come to 3/4 C. In fact, I had to adapt quite a few aspects of this recipe. So my version was delicious, and thanks for the foundation. This came out delicious! For future cooks, note that this took a solid hour from start to dinner – don’t expect to have anything in 13 minutes. My chicken turned out dark enough. I did saute, and I used the dark soy sauce. I also upped the garlic to about 5 cloves, and still added a bit of garlic powder. I did end up with a large pool of liquid at the end, like most others. I feel like this recipe could use more chicken? But I added a dash of corn starch and reduced for 10 minutes or so, and it was great. I cut up my chicken into bite size pieces, which felt appropriate for an Asian recipe. I’ll make this again! Hi Laura, great to hear that you have success with this recipe. Yes, you can use more chicken. The liquid part is due to the fact that we need at least 1/2 cup of liquid for pressure cooking to work. So you have to use the Saute function to reduce the sauce but corn starch is a good idea. I just made this recipe tonight. I skipped pan searing the chicken thighs and had to use flour instead of corn starch. The sauce turned out perfect! I did saute the sauce after the chicken was cooked to thicken it up and that worked perfect. Yummy recipe. Thank you! 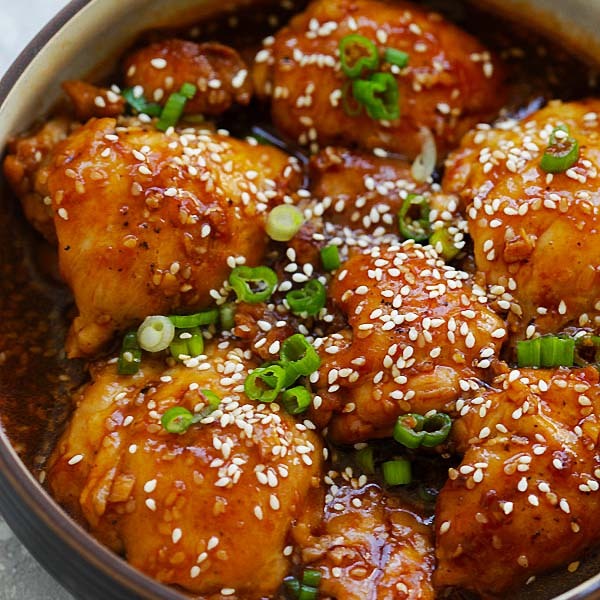 Hi Annie, thanks for trying this Instant Pot Honey Sesame Chicken recipe. I am glad you liked it.